Javadoc comment is a multiline comment /* */ that starts with the * character and placed above the class definition, interface definition, enum definition, method definition or field definition. If an annotation precedes any of the definitions listed above, then the javadoc comment should be placed before the annotation. If several multiline comments with javadoc identifiers are placed sequentially, only the one closest to the definition, right above it, with the javadoc identifier will be used. Javadoc comments should contain: a short summary (the first sentence), an optional documentation section, an optional tag section. The first sentence has a special meaning and should be clear, punchy, short, and is ended by a period symbol. Immediately after the first sentence, the main description could begin, which may be followed by the tag section. The tag section starts with the first block tag, which is defined by the first @ character that begins a line (ignoring leading asterisks, white space, and leading separator /**). * The long and detailed explanation what the method does. * @param value for doubling. // Single line comment (ignored). The long and detailed explanation what the method does. Attention that java comment starts with /*, following with Identificator of comment type. Javadoc Identificator is *. All symbols after Javadoc Identificator till */ are part of javadoc comment. Please note that javadoc-like (multiline comment with javadoc identificator) comment inside a method is not a javadoc comment and skipped by Sun/Oracle javadoc tool and by our javadoc comment matcher, but such comment will be in AST. You can find different types of documentation generation tools similar to javadoc on the Internet. Such tools rely on specific Identificator: "! ", "#", "$". Comments look like "/*! some comment */" , "/*# some comment */" , "/*$ some comment */". Such multiline comments are not a javadoc. Javadoc by specification could contain any HTML tags that let user generate content he needs. All tags are copied as is to result javadoc html pages by Sun/Oracle javadoc tool. All bad formatting is responsibility of user and web-browser. To validate Checkstyle to parse input to predictable structure - Abstract Syntax Tree(AST). It is very difficult to parse free style format, so input text need to follow some format, so limitation appears. The comment should be written in Tight-HTML to build nested AST Tree that most Checks expect. For more details about parsing of HTML into AST read HTML Code In Javadoc Comments and Javadoc parser behavior section. Every HTML tag should have matching end HTML tag or it is a void element. The only exceptions are HTML 4 tags whose end tag is optional (omittable) by HTML specification (example is TR), so, Checkstyle won't show error about missing end tag, however, it leads to broken Tight-HTML structure and as a result leads to not-nested content of the HTML tags in Abstract Syntax Tree of the Javadoc comment. In other words, if HTML tags are not closed Javadoc grammar cannot determine content of these tags, so structure of the parse tree will not be nested like it is while using Tight-HTML code. It is done just to not fail on every Javadoc comment, because there are tons of using unclosed tags, etc. Document Structure elements (DOCTYPE, <html>, <body>, etc) are not mandatory. 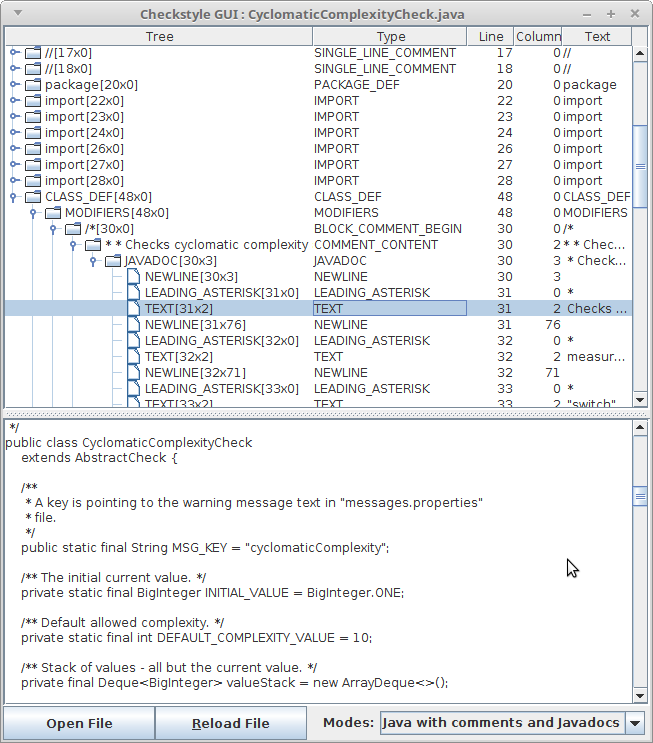 Principle of writing Javadoc Checks is similar to writing regular Checks. You just extend another abstract class and use another token types. visitJavadocToken(DetailNode) - it's a place you should put tree nodes processing. The argument is Javadoc tree node of type you described before in getDefaultJavadocTokens() method. Java grammar parses java file base on Java language specifications. So, there are singleline comments and multiline/block comments in it. Java compiler doesn't know about Javadoc because it is just a multiline comment. To parse multiline comment as a Javadoc comment, checkstyle has special Parser that is based on ANTLR Javadoc grammar. So, it's supposed to process block comments that start with Javadoc Identificator and parse them to Abstract Syntax Tree (AST). The difference is that Java grammar uses ANTLR v2, while Javadoc grammar uses ANTLR v4. Because of that, these two grammars and their trees are not compatible. Java AST consists of DetailAST objects, while Javadoc AST consists of DetailNode objects. Main Java grammar skips any whitespaces and newlines, so in Java Abstract Syntax Tree there are no whitespace/newline nodes. In Javadoc comment every whitespace matters, and Javadoc Checks need all those whitespaces and newline nodes to verify format and content of the Javadoc comment. Because of that Javadoc grammar includes all whitespaces, newlines to the parse tree (WS, NEWLINE). Checkstyle can print Abstract Syntax Tree for Java and Javadoc trees. You need to run checkstyle jar file with -J argument, providing java file. As you see very small java file transforms to a huge Abstract Syntax Tree, because that is the most detailed tree including all components of the java file: classes, methods, comments, etc. In most cases while developing Javadoc Check, you need to only parse the tree of the exact Javadoc comment. To do that just copy Javadoc comment to separate file and remove /** at the beginning and */ at the end. After that, run checkstyle with -j argument. As you already know Javadoc parse tree is a result of parsing block comment. There is a method to get the original block comment from Javadoc Check. You may need this block comment to check its position or something else in java DetailAST tree. For example, to write a JavadocCheck that verifies @param tags in Javadoc comment of a method definition, you also need all method's parameter names. To get method definition AST you should access java DetailAST tree from javadoc Check. For this purpose use getBlockCommentAst() method that returns DetailAST node. Checkstyle supports HTML4 tags in Javadoc comments: all HTML4 elements. HTML4 is picked just to have a list of elements whose end tag is optional(omittable) and a list of void elements (also known as empty html tags, for example BR tag). HTML4 elements whose end tag is optional (omittable): <P>, <LI>, <TR>, <TD>, <TH>, <BODY>, <COLGROUP>, <DD>, <DT>, <HEAD>, <HTML>, <OPTION>, <TBODY>, <THEAD>, <TFOOT>. Void HTML4 elements: <AREA>, <BASE>, <BASEFONT>, <BR>, <COL>, <FRAME>, <HR>, <IMG>, <INPUT>, <ISINDEX>, <LINK>, <META>, <PARAM>. If Checkstyle meets unknown tag (for example HTML5 tag) it doesn't fail and parses this tag as HTML_TAG Javadoc token type. Just follow Tight-HTML rules to make Checkstyle javadoc parser make nested AST, even though tags are unknown. [ERROR:0] Javadoc comment at column 1 has parse error. Missed HTML close tag 'audio'. Sometimes it means that close tag missed for one of previous tags. As you see Javadoc parser prints error and doesn't build AST if unknown HTML tag doesn't have matching end tag. If that a case please create an issue against Checkstyle to upgrade parser. There are also HTML tags that are marked as "Not supported in HTML5" (HTML Element Reference). Checkstyle Javadoc parser can parse those tags too if they are written in Tight-HTML. 1) Unclosed paragraph HTML tag. As you see in the tree, content of the paragraph tag is not nested to this tag. That is because HTML tags are not closed by pair tag </p>, and Checkstyle requires Tight-HTML code to predictably parse Javadoc comments. 2) Here is correct version with open and closed HTML tags. Checks can also be configured to log violation on encountering non-tight HTML tags. violateExecutionOnNonTightHtml property can be used for this purpose in the checks that support it. A custom check needs to extend AbstractJavadocCheck for having this functionality readily available. Do note that a check which has this property set to true will log violation only for the first not-tight HTML tag found. To allow a check to skip processing of javadocs with non-tight HTML, method acceptJavadocWithNonTightHtml in class AbstractJavadocCheck can be overridden in the check. The following example illustrates how to use this property. * <tt>violateExecutionOnNonTightHtml</tt> is set to true for the check. Checkstyle ends with 1 errors. Checkstyle ends with 5 errors. and choose "JAVA WITH JAVADOC MODE" in dropdown list in bottom of frame. Now you can see parsed javadoc tree as child of comment block. Notice that only files with ".java" extension can be opened. For detail reference you can see Checkstyle GUI documentation. Java checks controlled by method setTokens(), getDefaultTokens(), getAccessibleTokens(), getRequiredTokens(). JavaDoc checks use the same model plus extra 4 methods for Javadoc tokens. As Java AST and Javadoc AST are not binded. It is highly recommended for Javadoc checks do not use customization of java tokens and expect to be executed only on javadoc tokens. There are four methods in AbstractJavadocCheck class to control the processed JavadocTokenTypes - one setter setJavadocTokens(), which is used to define a custom set (which is different from the default one) of the processed JavadocTokenTypes via config file and three getters, which have to be overridden: getDefaultJavadocTokens(), getAcceptableJavadocTokens(), getRequiredJavadocTokens(). setJavadocTokens() - method then define actual set of tokens to run on. getDefaultJavadocTokens() - returns a set of JavadocTokenTypes which are processed in visitToken() method by default. getRequiredJavadocTokens() - returns a set of JavadocTokenTypes which Check must be subscribed to for a valid execution. If the user wants to specify a custom set of JavadocTokenTypes then this set must contain all the JavadocTokenTypes from RequiredJavadocTokens. getAcceptableJavadocTokens() - returns a set, which contains all the JavadocTokenTypes that can be processed by the check. Both DefaultJavadocTokens and RequiredJavadocTokens and any custom set of JavadocTokenTypes are subsets of AcceptableJavadocTokens. Javadoc Checks as well as regular Checks extend AbstractCheck class. So integrating new Javadoc Check is similar to integrating other Checks. See Declare check's external resource locations. The best source knowledge about how to write Javadoc Checks could be taken from existing Checks. This section shows how parser should/will behave during parsing of current HTML version and any new HTML version. Current version is HTML4, new version that need to be supported is HTML5. GeneralToken - mean that after parsing there will be general AstToken - HTML_TAG. SpecialToken - mean that after parsing there will be special AstToken - PARAGRAPH, .... . Note: "Nested"/"Non-Nested" is not applicable for this type of tags - all of them are looks like Non-Nested. Flas "hasUnclosedTag" is "false" for all cases.